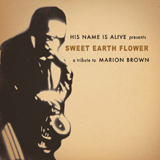 Sweet Earth Flower: a tribute to Marion Brown is His Name Is Alive's meditative ode to the work of the under-sung free jazz saxophonist. Veterans of the American rock underground, His Name Is Alive has been exploring various musical tangents since the early 1990s, slowly moving closer and closer to a more improvisational, jazz-oriented base. The brainchild of Michigan-based, multi-instrumentalist/producer Warren Defever, His Name Is Alive was initially signed to the illustrious British label 4AD, a relative rarity for an American band. Ethereal and spacious, the band's sound has grown gradually over the years, incorporating funk, soul, R&B, folk, garage rock and world music into their expansive sound. Collaborating with members of the Afro-beat horn ensembles Antibalas and Nomo, His Name Is Alive blends atmospheric electronic textures with reverberant horns for a sensitive tribute. Shuffling along simmering rubato grooves and psychedelic soundscapes, the assembled forces congeal in a wholly organic fashion. Electronic piano washes refract over arco bass drones and shimmering percussion, while plangent horns drift in and out of the mix. Drawing stylistic inspiration from Brown's introspective 1970s period lends a serene and exploratory feel to the session. His Name Is Alive brings a sense of respectful admiration to these pieces, honoring Brown's spirit while making its own subtle mark on the work. Only on Harold Budd's "Bismillahi 'Rrahmani 'Rrahim" does the band break out with a cathartic electric guitar feedback and multiphonic sax duo that reaches for the heavens. An ideal introduction to jazz for the novice, Sweet Earth Flower is less turbulent than Brown's earlier and more readily available music, capturing the spirit of Brown's later oeuvre with considered restraint and focused determination. Track Listing: Sweet Earth Flying; Juba Lee; Capricorn Moon (live); November Cotton Flower; Bismillahi 'Rrahmani 'Rrahim; Geechee Recollections (I); Geechee Recollections (II); Sweet Earth Flying (live). Personnel: Warren Defever: guitar, piano; Elliot Bergman: tenor saxophone, Rhodes; Jamie Saltsman: double bass; Justin Walter: trumpet; Jamie Easter: percussion; Dan Piccolo: drums, percussion; Michael Herbst: alto saxophone; Erik Hal: electric piano; Olman Piedra: congas, cajon.